Unfortunately the CPSC decided to move forward and reduce the lead content in products intended for "children" from 300ppm to 100ppm (parts per million) effective August 14, 2011. (Originally it was 600ppm when the law first took effect) This unfortunately was required by Congress, provided the CPSC in its rulemeaking function determined that it was "technologically feasible" to get the lead down to 100ppm. As the bicycle industry indicated in testimony before the CPSC this effectively eliminates the use of all recycled steel frames, most of which are used to make low cost children's bikes (low cost is helpful here as the children quickly outgrow the bikes). The bicycle industry also indicated that at this point in time lead testing results were not very reliable when you try to reach below 300ppm. Ahh..but its "technologically" feasible with NASA level equipment. Well sure, but we are not building a space shuttle and the recreational sports industry does not have NASA's "budget" (tax dollars). The CPSC of course focused on "technologically" feasible, not "economically" or "reasonably" feasible. Thank you congressional staffer that used a poor choice of words. (see definition in bold below which was what the CPSC was using as guideance). The bigger point here is that this law was flawed from the start. No children in the USA are dying or getting sick from lead poisoning in toys, bicycles or motorcycles. The biggest "lead" threat to children does not come from consumer products. The law should only have applied only to specific items likely to go in a child's mouth (shown by empirical evidence). Bicycles, motorcycles and most recreational products don't. Unfortunately Congress chased lead (and a few select phthalates) as the only bogeyman (thanks to misled consumers and the media) and did not even focus on the most plentiful sources of lead to kids. We need to focus on what is really harming kids in the US. Lead is not in the top 20. The bigger problem is the whole race to go from 600ppm to 100pm is futile and will not insure any greater safety, but will incur exponentially more costs for small businesses. This is the problem with regulation. "Regulation" always looks and sounds good from 20,000 feet up until people that really have to make the widgets take a close look at it and what will really be required to implement it. Then you see the nightmare train wreck. But people with lifetime jobs in Government could care less about your small business job. And we wonder why unemployment is still so stubbornly high. We all thought the CPSC would do the right thing in implementing the law via regulations, but the fact is that no one is willing to stick their neck out in government and declare the "emperor has no clothes" (or that this law and the 100ppm standard really does nothing at all to protect children and just harms US small businesses). The same is true in Congress. If a legislator came out and said reducing lead 600ppm to 100ppm means nothing to children's safety the "children's lobby" would accuse then of "wanting to harm children and puppy dogs". Some have come out and been bold but were outnumbered and outvoted. The only thing on the table now with any hope of passing (any time this summer) is HR 1939 which has been stalled in "mark up" since Mid May 2011. So starting on August 14, 2011 manufacturers and distributors of children's products must comply with the new 100 ppm federal limit for total lead content. CPSC will not enforce the CPSIA's independent third party testing requirement for total lead content until December 31, 2011, due to a stay of enforcement that is already in place. There are some legitimate questions and ambiguities regarding how the new 100 ppm requirement interacts with the latest "bicycle-motorcycle stay" thru December 31, 2011. The first is whether or not your company complied with the stay's initial requirements (which required some onerous reporting) and if you failed to do that whether or not you can take advantage of the stay thru December 31, 2011. Finally there is a question as to how the stay thru December 31, 2011 interacts with the current 100 ppm lead requirement. One could argue that you have to make sure lead is below 100 ppm in your children's product but you don't have to "test and certify". Apparently this sort of "catch 22" makes sense to people in government. The reality is that the CPSC likely will not be chasing down manufactures of bicycles and motorcycles on the 100 ppm requirement until after December 31, 2011, but I would not want to bet my company on that or anything the CPSC may or may not do. They are just too unpredictable these days. Finally, to add to the confusion, lead content levels for children's products (the base material) are different than the so called "lead paint/coatings standard" which has been .009 percent since August 14, 2009. ACTION: Notice, reopening of the hearing record. 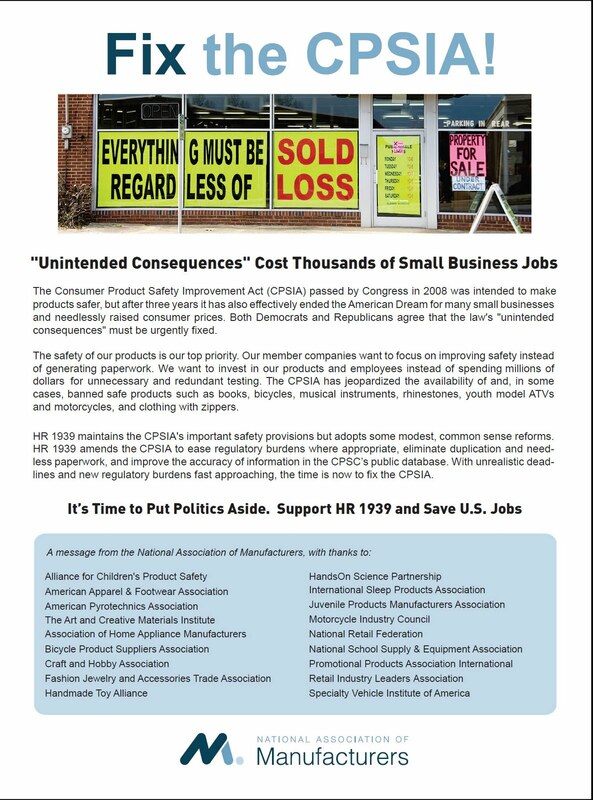 SUMMARY: Section 101(a) of the Consumer Product Safety Improvement Act (``CPSIA'') provides that, as of August 14, 2011, children's products may not contain more than 100 parts per million (``ppm'') of lead unless the U.S. Consumer Product Safety Commission (``CPSC,'' ``Commission,'' or ``we'') determines that such a limit is not technologically feasible. The Commission may make such a determination only after notice and a hearing and after analyzing the public health protections associated with substantially reducing lead in children's products. On February 16, 2011, the Commission conducted a public hearing to receive views from all interested parties about the technological feasibility of meeting the 100 ppm lead content limit for children's products and associated public health considerations. Individual Commissioners requested at the hearing that certain participants respond to additional questions in writing, as well as submit relevant studies and additional data referenced in oral presentations. Accordingly, through this notice, the Commission is reopening the hearing record until March 24, 2011. Supplemental Materials may be submitted to the Office of the Secretary by e-mail at cpsc-os@cpsc.gov. Submit written submissions in the following way: Mail/Hand delivery/Courier (for paper, disk, or CD-ROM submissions), preferably in five copies, to: Office of the Secretary, U.S. Consumer Product Safety Commission, Room 502, 4330 East West Highway, Bethesda, MD 20814; telephone (301) 504-7923. Instructions: All submissions received must include the agency name and docket number for this notice. All materials received may be posted without change, including any personal identifiers, contact information, or other personal information provided, to http://www.regulations.gov. Do not submit confidential business information, trade secret information, or other sensitive or protected information electronically. Such information should be submitted in writing. Docket: For access to the docket to read background documents or comments received, go to: http://www.regulations.gov. FOR FURTHER INFORMATION CONTACT: Concerning submission of materials: Rockelle Hammond, U.S. Consumer Product Safety Commission, Bethesda, MD 20814; telephone: (301) 504-6833; e-mail: cpscos@cpsc.gov. For all other matters: Dominique Williams, U.S. Consumer Product Safety Commission, Bethesda, MD 20814; telephone: (301) 504-7597; e-mail: dwilliams@cpsc.gov. (4) Alternative practices, best practices, or other operational changes would allow the manufacturer to comply with the limit. We held the hearing on February 16, 2011. We heard presentations by and received comments from consumer groups, manufacturers, associations, and laboratories regarding the technological feasibility of meeting the 100 ppm lead content limit. At the hearing, individual Commissioners requested that certain participants respond to additional questions in writing and submit relevant studies and additional data. Through this notice, we are announcing that we have placed individual Commissioner's additional questions into the docket and will place any responses into the docket. The questions submitted and responses that are received will be made available on http://www.regulations.gov under Docket No. CPSC-2010-0080, Supporting and Related Material. The Commission will consider any additional material received during the reopening of the hearing record, in addition to information collected at the hearing, in the course of evaluating its response. The Commission is reopening the hearing record to add individual Commissioner's questions to the docket and allow for responses to those questions, and so the hearing record will remain open until March 24, 2011.